What comes to my mind immediately in association with Cairns is The Great Barrier Reef, World Heritage Tropical Rainforest, strong Aboriginal spirit and stretches of beautiful beaches you can sunbathe at or have picnics at, but cannot actually swim at most of them – so it is like standing by a spring of water, thirsty, unable to drink. As if it did not suffice that Australians suffer the highest rates of skin cancer in the world since the UV radiation levels are higher as the continent is located close to the ozone hole over the Antarctic (and during summer, the earth’s orbit brings Australia even closer to the sun, resulting in an additional 7% of solar UV intensity, which means that Australians are exposed to up to 15% more UV than Europeans), they say that Australia is also a country where animals try to kill you! Most of the world´s most venomous animals live on this continent and many of these in Northern Queensland (i.e. 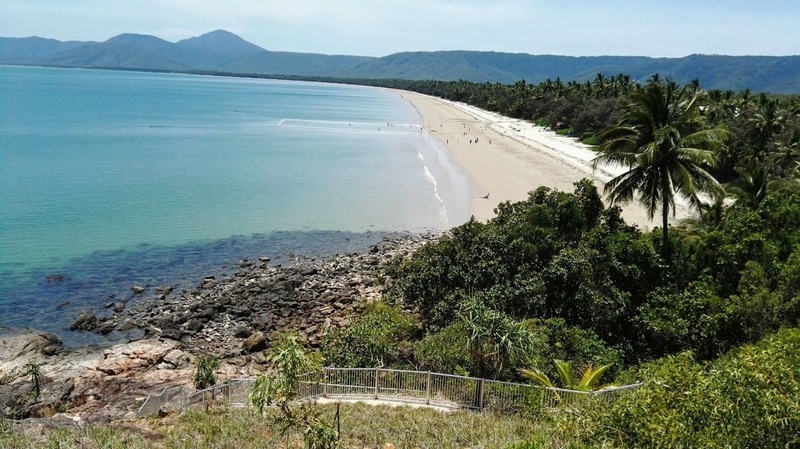 Cairns too), including: irukandji jellyfish, box jellyfish, crocodiles, cone shells, stonefish and sharks (of course, they are everywhere in Queensland). Crocs and various stingers are a great threat in Cairns as they frequently occur in the wet, summer season and cause severe injuries and even deaths. That is why you cannot swim anywhere, but in specifically designated areas protected by sea nets. Funny enough, these nets are taken out of the sea at times of dramatic weather forecasts, so then you can just sit on the beach and look at the sea! It is normal to find first aid vinegar bottles (to be applied on the stings) near the beaches as well as pictograms warning about crocs and stingers. When I arrived to Cairns, everyone was freaking out as the media said there´s a cyclone coming. 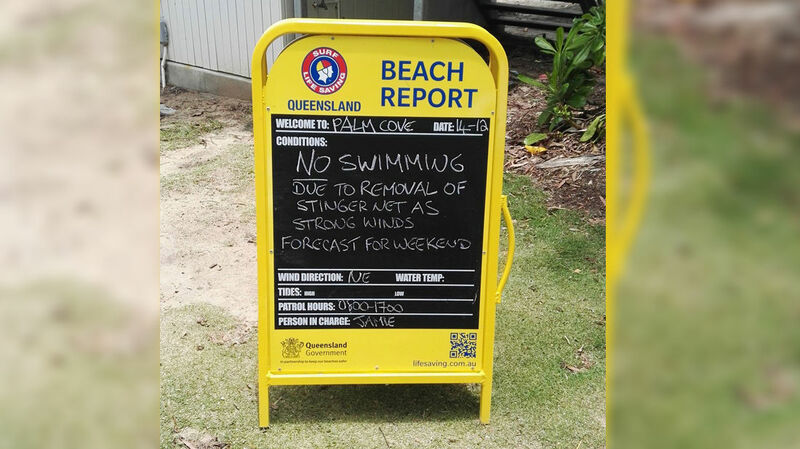 The beaches would bear signs saying NO SWIMMING (even in the designated areas) as the nets were removed for safety reasons due to those forecasts (while the weather, eventually, did not turn out to be that dramatic). Luckily, Cairns – on its own a simple, not a particularly interesting town (with mud-dirty sea as it spreads around a man-made mud-base marina) where the main tourist attraction is an artificially created swimming pool (called poetically a lagoon) that smells of chlorine (as it takes all sorts to swim in there and even perform their hygienic needs there) – has some amazing fresh water swimming areas with pristine clear water, such as Crystal Cascades and the Fairy Falls (located nearby), Josephine Falls, Mossman Gorge – with the most beautiful river I have ever seen – and many “hidden” little creeks, lakes and pools surrounded by stunning tropical rainforests (trust me, you do not need to go to the tourist-laced Daintree National Park, listed as World Heritage Site by UNESCO in 2015, to get the Wet Tropics Rainforest experience), out of which my favourite would probably be Moore´s Gully creek with two lovely small falls dropping down ochre rocks, unknown to tourists yet familiar to the locals, especially those who live in the suburbs of Trinity and Kewarra Beach. 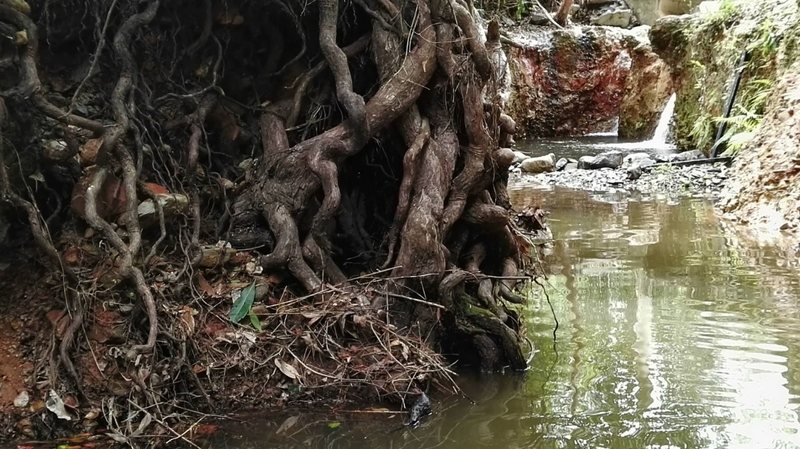 Bordering The Reserve, Moore’s Gully is a riot of native trees with trails for walking and cycling and tropical butterflies flying around. Now, no need to mention that Australia is a vast country. 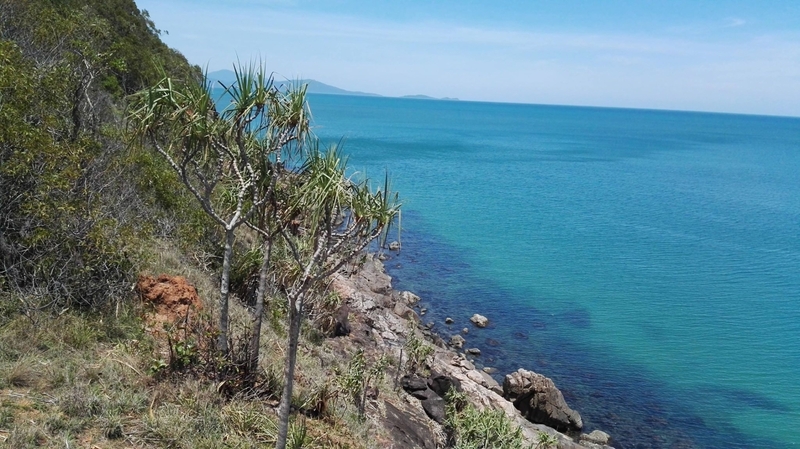 So after my two-hour-flight from Brisbane to Cairns, I found myself in a completely different climate: extremely hot (with temperatures above 30 degrees) and humid. Summers here are the wet season while winters (with temperatures around 25 degrees) are dry (so the high season here is actually winter). And the wet seasons can have some nasty surprises in stock, such as massive storms, strong winds and floods. When you travel, you have to trust: in the kindness of strangers as well as weather. You wish for neither to be temperamental and capricious. 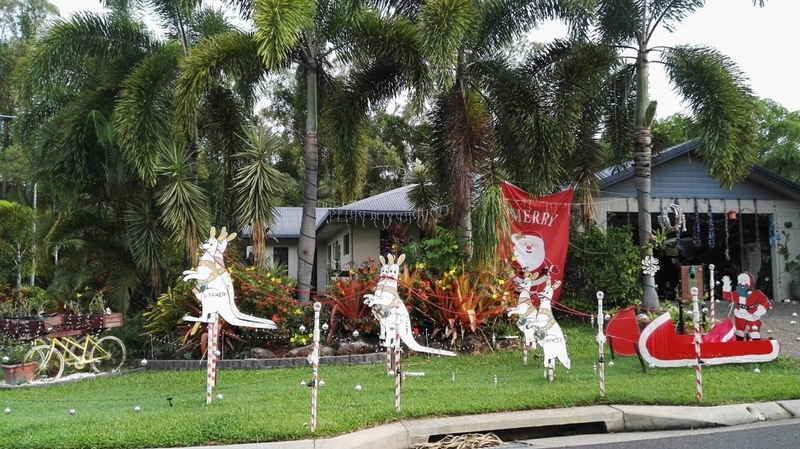 I happened to arrive to Cairns when the media threatened with cyclone catastrophes and dramas. 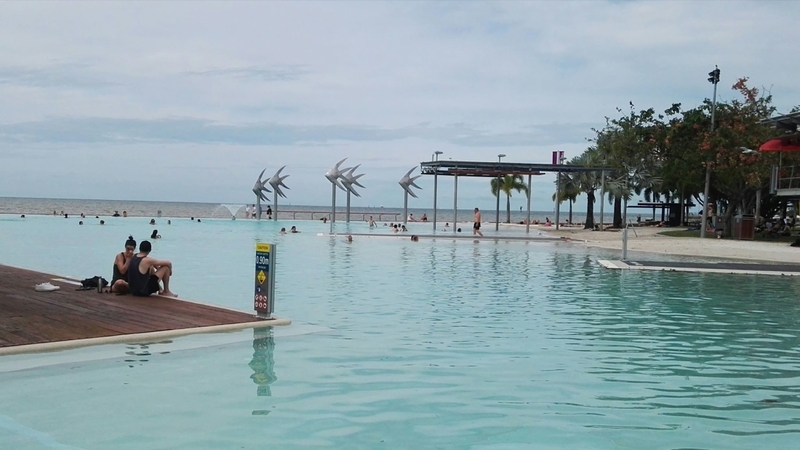 I came to Cairns mainly to fulfil my dream of diving at the outer Great Barrier Reef but due to the cyclone fear many companies cancelled their boat trips to the Reef. I was determined to go as I knew deep inside me I would be safe and all the fuss´s about nothing. While travelling I have been learning to listen to my intuition rather than anything else. And this time, as usually, it paid off for me. I found a company that was going on the day which was predicted to be the most catastrophic one. There were in fact only two companies going to the ocean on that day… I guess, when you believe, things are bound to work out… While it was pouring with rain in Cairns, it was nice on the ocean, with just a few minor showers, reasonable waves and even a bit of sunshine. I got to see the first shark in my life passing me peacefully at a touch distance at the first stop at Thetford Reef, befriended some fish and blue jelly fish (I thought in the beginning that they´re dangerous but when I had to swim at one point through a shoal of them without getting stung I understood the misconception and enjoyed their company of light and colour and soft touch) and made another of my dreams come true – against all odds! I was thrilled too when at our second stop as soon as I jumped into the water to enjoy relaxing snorkelling a small juvenile golden trevally came around and stayed with me for the time of my snorkelling session, which lasted for about 30 to 45 minutes. Golden trevally fish are found either as a solitary individual or in small schools. Juveniles form schools which tend to follow or “pilot“ larger fish such as groupers or even sharks. Their manoeuvrability protects them from their hosts while they are provided with protection from predation from other fish. This behaviour extends to scuba divers, and I was lucky enough to get this single young individual stationing itself near my face and hands so I could touch it and play with it as we went on exploring the Milln Reef. 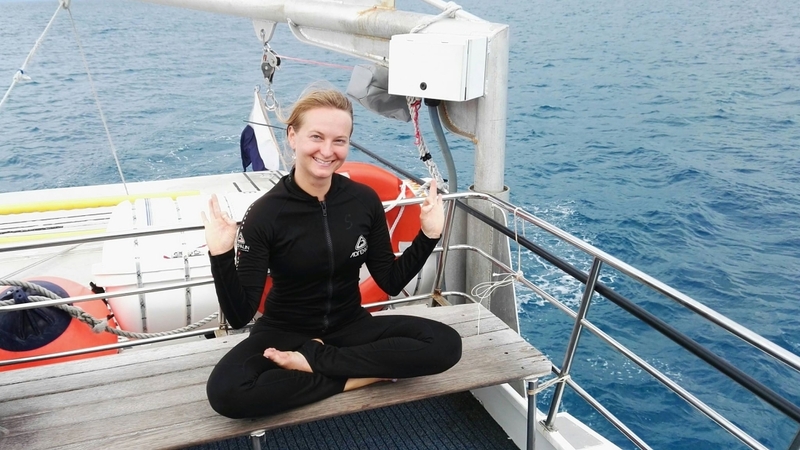 Generally, the companies in Cairns offer similar packages of two snorkelling sites, one introduction (discovery) dive (10 to 12 metres deep, 15 to 35 mins in total) and a lunch on the boat for approximately 230 dollars. The company I went with stopped at Fitzroy island on top of the deal. The crew was lovely and I was fortunate enough to get a dive instructor only for myself, as the other girl who was supposed to dip into the water with me was unable to come at the appointed moment due to her mental condition. Sebastian made sure I was alright when the shark passed by and pointed out another one to me swimming just above, he let me dive slightly deeper than officially allowed when he saw how I was enjoying myself and fooled around making underwater air bubbles till he got me laughing (to the extent that my mask and gear allowed me to). The only thing that could have been better on my tour would be getting a snorkelling guide (as the standard is in e.g. Bali) who would point out some cool parts of the Reef because obviously the professionals know exactly where to go while we had to find our way around. Sadly, what probably cannot be changed by now is the fact that the Reef is bleached and broken at many parts. I blame the activity of mankind for that and appreciate the fact that Australian government is spending a lot of money to protect and conserve the Reef now, though it might be a little too late. I believe there are still stunning and undamaged parts of the Reef but tourists would not probably be taken there, which, after all, is good, because seeing what harm some people can cause with their fins just because they are clumsy or ignorant made me sorrowful. 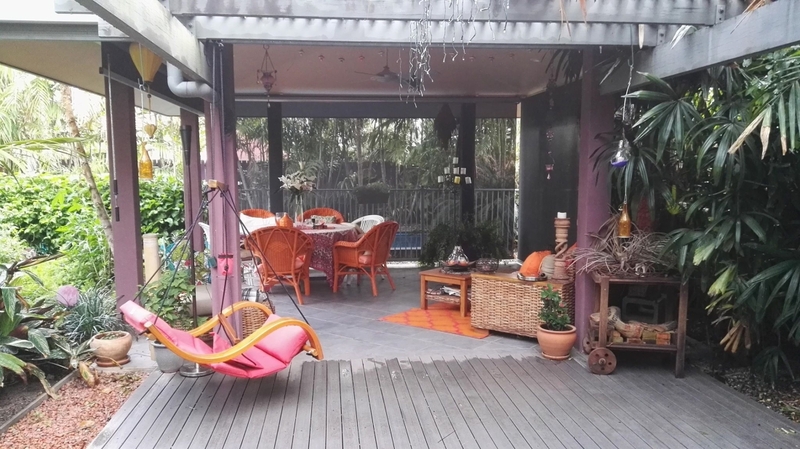 During my stay in Cairns I was accommodated through couchsurfing (completely free of charge) at a marvellous host lady (of about 62 years of age, a 50-year-old looking body and a 35-year-old youthful spirit) whose name is Dee. She also has an Aboriginal name as she spent a part of her life living with Aboriginal communities e.g. in Alice Springs, so she has great knowledge of plants and animals as well as Aboriginal traditions. This genuine woman inspired me with her knowledge and opinions. She travelled the world around herself and thus is understanding of the needs and emotions of a traveller. I felt truly welcome. 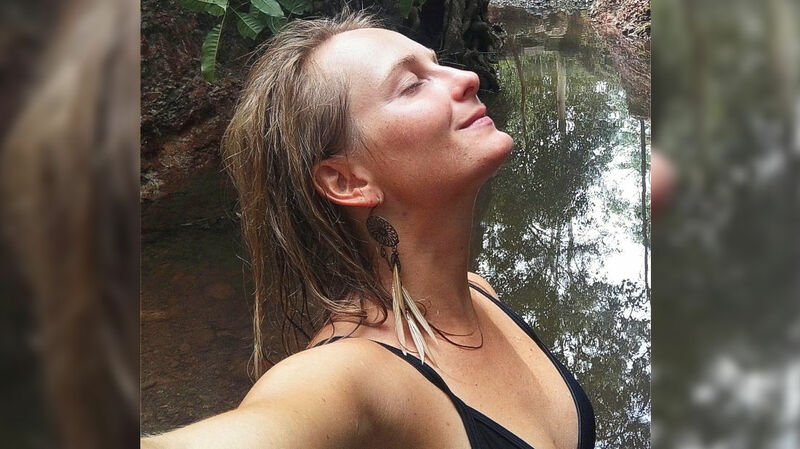 I had a bedroom and a bathroom of my own in her big house and I thoroughly enjoyed the beautiful tropical zen garden she has created which left me speechless when it opened to me in the central courtyard for the first time. I will never forget our morning yoga and meditation with the sound of chimes and the view of the garden… Dee is also an amazing cook so her dinners felt like a pure blessing of love. I appreciated her care for and about others, people (she used to be a nurse), animals (she shelters three dogs and a cat and is a complete vegetarian), the environment (her house runs on solar energy and implements water saving precautions), her organic way of life and her support of local farmers. 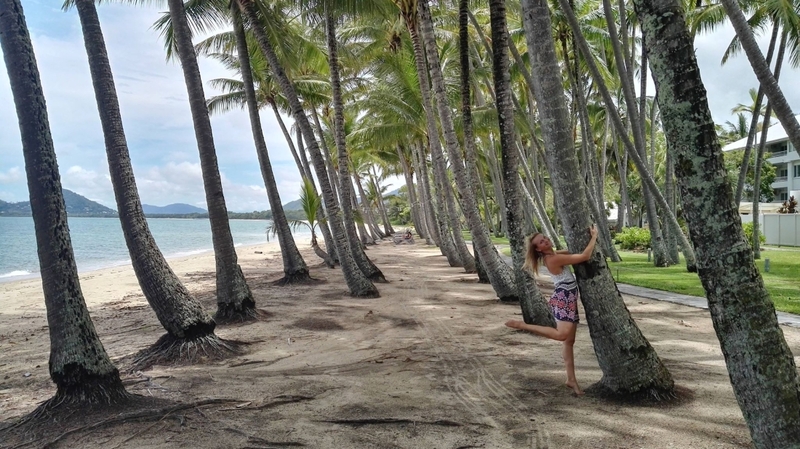 We shared some very special experiences such as beach yoga at the Resort and Spa at Kewarra Bech where she lives, a visit to a Buddhist centre near Cairns, a bush walk and a stroll down the lovely Palm Cove beach with its many cool cafés and cute little shops occuring along. Dee also became a real friend in need when I could not get downtown in time enough for my diving trip. She helped out and I will always remember her flexibility and resilience when it came to a truck car tyre changing which she managed on her own in about ten minutes! Dee could not take me to the place as her car had some problems with the steering, but through the help of my lovely Australian-Italian friend and soul brother, Marco, who happened to be in Cairns when I was there, I managed to find a person willing to drive me there for reasonable money, “last minute”, on the last day of my stay in Cairns (in fact, I was leaving that very afternoon, so the ,ission had to be accomplished successfully in the morning). 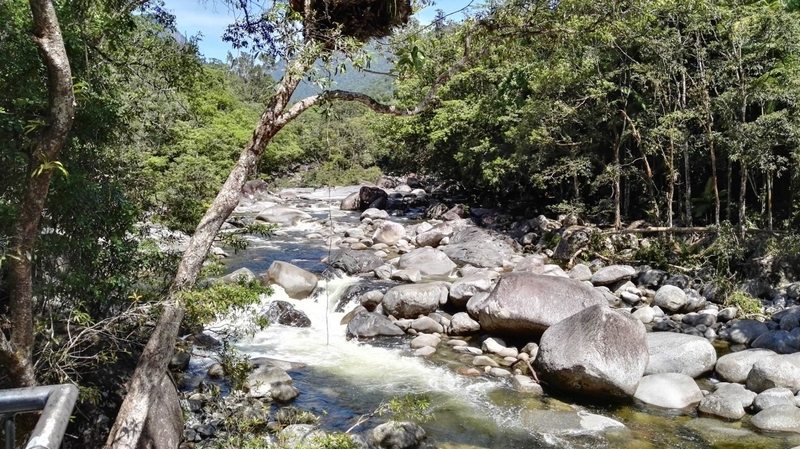 The quest to Mossman Gorge, the traditional homeland of the indigenous Kuku Yalanji people, with Terry, a French Canadian young scientist and sportsperson, was unforgettable in its own way and as strong as the Jenolan Caves healing quest I have spoken about here. 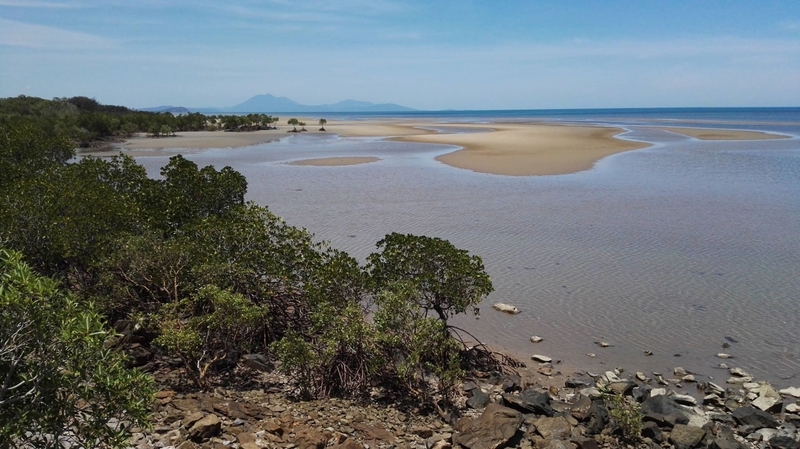 The Eastern Kuku Yalanji (Goo-goo Ya-lan-gee) people have occupied this area for thousands of years and they are recognised as the Traditional Owners of it. The energy of the place is amazing and intense and neither the tourist centre with a shop, nor the shuttle buses or the metallic suspension bridge (running across the Rex Creek close to where it enters the Mossman River, linking the carpark area to a 2.4 km rainforest loop track) can change the genuine feel of it. 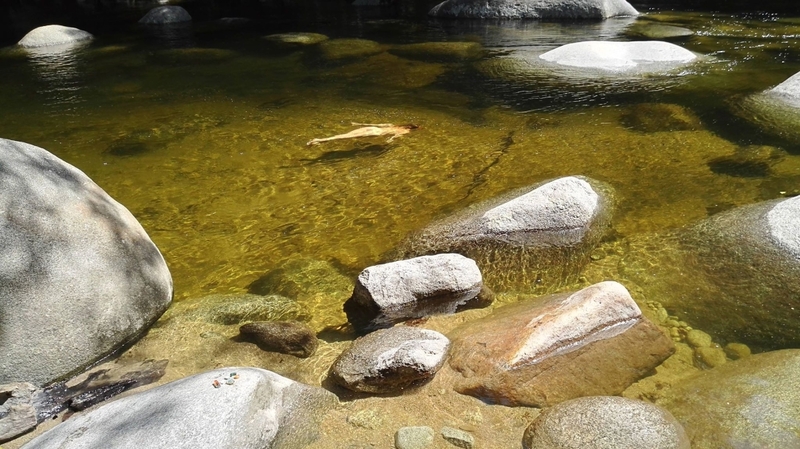 The water is pristine clear and wild, so wild that the cyclone threat made the area inaccessible for a few days as the rangers were worried about floods and currents. Terry and I refused to follow the restrictions and walked under the barriers to get a swim in the river which seemed welcoming and calm enough. The rangers came to kindly ask us to leave the water at one point (only to open the spot an hour later as the threat of floods has subsided and the prohibition of swimming was officially cancelled) so we moved further up the stream where there was nobody there and got our ritual and spiritual connection with the water and the land around. A great article, well written.